Ed received his B.S. Degree in Accounting from the University of Illinois at Chicago. He is registered to practice as a Certified Public Accountant in the State of Illinois. He was awarded the designation of Certified Financial Planner by the College of Financial Planning and the International Board of Standards and Practices for Certified Financial Planners. He was awarded the Personal Financial Specialist designation by the American Institute of Certified Public Accountants. 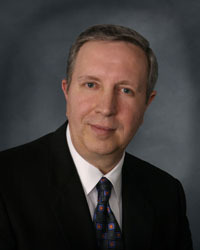 Ed has practiced as a CPA for over thirty years. Before joining David J. Miller & Associates, LLP in 1983, he was affiliated with two local certified public accounting firms. His areas of concentration include business consulting, accounting, auditing, tax and financial planning. He is a member of the American Institute of Certified Public Accountants and its Financial Planning Division. He is also a member of the Illinois CPA Society. Ed was born in Chicago, Illinois. He is married to Marina and they reside in Libertyville, Illinois. They have two married daughters and three grandchildren. Carrie’s family lives in Florida and Jennifer’s family lives in Texas. His leisure time includes golf, working out and reading.